Our second day in California’s wine country got off to a lazy start at my new favourite coffee spot in Santa Rosa, Flying Goat Coffee. 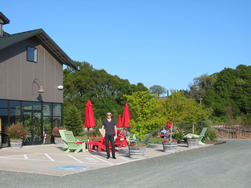 After taking a leisurely stroll around Santa Rosa’s historic Railroad Square, we hopped in the car and headed toward our first stop of the day – Mazzocco Winery, near Healdsburg. I had been emailing back and forth with Mazzocco for a while regarding a sample bottle they wanted to send me. Because of British Columbia’s antiquated and ridiculous liquor laws, it’s next to impossible to receive wine as samples in our province (I know – go figure)… so, while I was down in the area, it made sense to drop by, pick up the sample and taste the rest of the current releases. 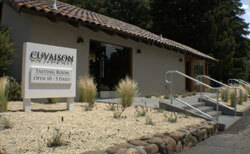 It was Saturday, so that meant that both the parking lot and tasting room were chock full of Mazzocco wine fans. Candace and I made our way in and found a little corner at the tasting bar. I’ve liked pretty much everything I’ve tried from Mazzocco, so I was looking forward to trying their new wines. I’ll give something away here – I wasn’t disappointed. At all. Nice notes of vanilla, butter, caramel and citrus lead to a balanced and crisp finish. 5 years in oak produced a smoothly balanced wine with a lot of vanilla and licorice spice to the dark currant flavours. This had a nice vanilla edge and some cracked pepper and a tonne of dark cherry/berry fruit with a long finish. This was very firm and tannic, yet approachable with its licorice and black cherry/berry flavours. This was the first Zin of the tasting and wow – the pure fruit that Mazzocco gets out of their Zins is so good. This had big ripe blackberry syrup with a vanilla bean edge. The finish lasted minutes. Big, delicious ripe red berry fruit with a syrupy edge and a long, long finish. A dose of Petite Sirah added some tannic heft to this full-bodied dark berry bomb. So good. Wow. I’m starting to sound like a broken record, but… again – this wine has outstanding dark berry with a syrupy edge to its long and pleasantly tannic finish. Mmmmmmm… the Maple Reserve. I really liked this (though I have to say that I really liked all their Zins). This one stayed with me just a little bit more. It had a dusty edge to its dark berry fruit with a touch of brown sugar to the long finish. Outstanding. The winemaker’s personal reserve. 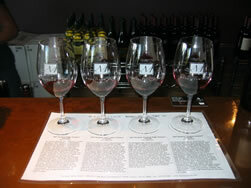 Ever wonder what an over-$100 Zinfandel tastes like? Like this… or this is what that should taste like. When I reviewed the 2006, I called it “possibly the best Zinfandel I’ve ever tasted.” Well this may have surpassed it. Although the previous wines were great Zins, this was just a step above. Firm, but fine tannins cap the delicious dark fruit. Wow. Just wow. This is just about right up there with the Antoine Philippe. This is the personal reserve chosen by the winery’s owner, Ken (Kenneth Carl) Wilson. It’s immense, with blackberry, black pepper and licorice. The finish just keeps on going. Another amazing effort. I’d like to give a shout to Bernie (that’s her with me in the pic above), who despite having a packed tasting room, manged to keep the samples coming and was kind enough to fill me in on every wine we tasted and even showed me pics from the different vineyards. The Zinfandels that Mazzocco turn out really hit my palate in all the right ways. They’ve got big and balanced fruit flavours with a briary edge to the firm, but not too firm tannins. Candace agreed. She picked these as her favourite wines of the trip. After leaving Mazzocco, I chose to drop in at nearby Mauritson Wines. Last summer, while in the area for ZAP, I had picked up a 2004 Cabernet Sauvignon, Sonoma County from them and was curious as to what their other wines might be like. This had crisp citrus fruit and a nice mineral edge to the finish. Very refreshing. I really liked this. It had a crisp citrus edge to its tropical fruit that led to a long finish. A very nice effort – only 457 cases were produced. There was an almost meaty edge to the pepper and dark berry/cherry fruit. Very tasty. This had refined and tasty black currant fruit with a vanilla edge. The tannins were fine, but firm and the finish lasted minutes. This could definitely benefit from some time in your cellar. These are the wines for which Mauritson is best-known. I hadn’t really tried them before and have to say that I was very impressed. They were very well-balanced with loads of spice and dark fruit. Tasty jammy ripe red berry fruit with black pepper and really nice mineral-edged tannins on the finish. Really good stuff. This really grabbed me. I picked up flavours of black pepper, licorice, dark chocolate and juicy dark berries. I got a bit of a meaty edge to the nose of this wine… but the flavours were all about the dark berry fruit along with licorice. Wow – a very tasty Zin. This is a bit of a monster – it’s got all the beautiful dark Zinfandel fruit, but with layers of complexity and a load of tannins on the finish. This is the one I tasted that could sit in your cellar for a while. Very, very good. There were a few other wineries I would have liked to have visited on Saturday, but quality should always win out over quantity. 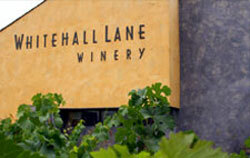 I would whole-heartedly recommend visits to both wineries. 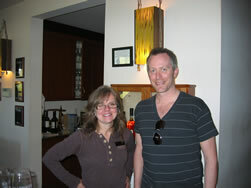 The folks manning the tasting rooms were unbelievably friendly and the wines… well, there wasn’t a dud in the bunch. Check them out. Your taste buds will thank you. I picked this up the other night when I was in the mood for a crisp Riesling… something that happens fairly often. The nose showed a tonne of zesty grapefruit, lime and dusty-flinty stone. I love Riesling. A sip gave a refreshing squirt of fresh grapefruit and lime and finished off with that I-just-licked-a-rock flinty minerality that stays around for a bit. It really hit my taste buds in the right way. This wine really hit the spot, especially if you’re not in the mood for, say a Spätlese with its hint of sweetness – not that there’s anything wrong with that. Its crisp minerality is just right in that tangy kinda’ way. It’s a perfect aperitif wine (sitting around sipping on its own) and its crisp acidity means it would also pair very well with foods like sushi, squash soup or even a salad. Tasty stuff… and oh yeah, drink more Riesling!